It is impossible to attend a Thimblemill Library gig and not let the visual splendour of rows of books seep into your thoughts. When you factor in an English Literature and Creative Writing graduate (or major depending on your language perspective) into the equation, who co-incidentally happens to write the most gorgeous of songs, the scene is perfectly set. 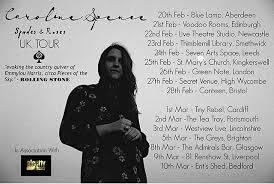 Caroline Spence may have been 4,000 miles from her Nashville home, and on an inaugural overseas tour, but she settled into the surroundings without hesitation and went on to deliver a sublime performance of songs soaked to the core with southern sentiment. Any doubts that the promise of SPADES & ROSES would not live up to its billing drifted away into a cold Midlands night, suitably insulated by the warmth of the performance. The album in question is Caroline’s second full length release and bravely fought off a challenge from some upstart going by the name of Jason Isbell to earn this coveted accolade in 2017. Another healthy Friday night gathering in the library, were treated to eight songs off the record and a near perfect introduction to those taking a gamble on an artist not heard before. Using an assured poise and composure as a launching pad, Caroline effortlessly sunk her sumptuous vocals into each song combining them with a subtle acoustic guitar accompaniment. Although she has acquired the multi-layered music skills of acclaimed UK versatile guitarist CJ Hillman for this tour, a TV divert for him meant she flew solo for this gig. This obviously proved no hindrance to a travelling artist used to the constant lonely singer-songwriter life back in the States, and for the audience it was a case of, what you haven’t seen, you haven’t missed. Having seen CJ play live numerous times, the enhancement can be vividly imagined though and the bulk of fans on the tour will experience this. Caroline launched her single set in a similar vein to the album by opening up with ‘Heart of Somebody’. Like the vast majority of gigs seen, a small element of adjustment is required from all parties to hit the perfect channel, but it would be remiss to say that Caroline had not found hers by the time the set hit the second song ‘Hotel Amarillo’. At this point, we had entered the critical zone of informed singer-songwriter chat and a relaxed persona helped recount tales of touring her vast homeland as the stories got underway. The song from SPADES & ROSES that came over the best live for me was ‘All the Beds I’ve Made’, introduced simply as a love song. Pushing it to the limit was the hugely personal and emotively sung ‘Southern Accident’, of which the first half of the title proved a common theme throughout the show. Fondly recalling her grandmother, and a Virginia home before the calling of Nashville emerged has the place to chase your dreams, proved a comforting place for Caroline to take her mind. Added southern lore was expanded in explaining the background to the song ‘Bless Your Heart’, one of a handful of songs to be taken from her first album SOMEHOW released in 2015. Of course, there were members of the audience who have seen acts like Worry Dolls, Wild Ponies and Angaleena Presley that were au fait with this phrase, but it still brought a smile to the majority. ‘Trains Cry’ and ‘Whiskey Watered Down’ were the other older material turned to and thankfully, Smethwick scored full marks in the Parsons/Earle/Van Zandt mini quiz. On the topic of Gram Parsons, one of only two covers dealt on the evening was a version of ‘Hickory Wind’, complete with a subtle twist to the opening by changing South Carolina to south west Virginia in a spate of home state pride. This version was prompted by a cover she was asked to perform on a recent radio session. Not one to hide her thoughts on the current country mainstream, a dive into the archives won the day. The other cover was also unsurprising, given Caroline’s adoration for Bruce Springsteen. ‘Dancing in the Dark’ closed the evening and the best thing you can say is that for a brief three minutes, Caroline owned the version with her arrangement, before hastily handing it back to the Boss. Covers and old numbers aside, it was the songs from the recent album that defined the show. Sadly, ‘Softball’ was left in the locker room for this set, but ‘Slow Dancer’, ‘I Can’t Complain’ and ‘You Don’t Look So Good (Cocaine)’ served this stellar release to the highest degree. There was a little revelation to where the inspiration for ‘Wishing Well’ came from, but sometimes what happens on stage, stays on stage. Caroline is not the first from her Nashville song writing community to cross the pond. Indeed, the stage she inhabited this evening has hosted Wild Ponies and Erin Rae in recent times. She was however most welcome and the invite to return extended warmly. A familiar face on the Midlands acoustic circuit in Dan Hartland opened the show. He has been using a short run of local dates to launch a brand new album. A slightly increased allotted time this evening allowed Dan to show more of his fine song writing skills, delivered by strong vocals and demeanour to warm to. No local scene is complete without its core performers, who avidly provide sterling support to, often, overseas guests just passing through town. We are now approaching the twelve-month anniversary to when SPADES & ROSES first flickered on my horizon before taking hold. In one aspect, this gig closed the book and thoughts turned to what next from a singer-songwriter with a sure fire capacity to evolve creatively. In another, it was a pleasure to see such a positive reception from an increasing number of admirers. Bigger, more successful and wider known performers than Caroline Spence will cross my path on this musical journey, but few, if any, will hit that zone in how they write and perform the heartfelt song. Thimblemill Library experienced that on this February evening.